Indeed, the only issue to be discussed about Syria is not the situation on the ground (which may be complicated), but the legitimacy of the interventionist policies of the U.S. and its “allies”, Europeans, Turkey, and the Gulf states in that country. For decades, the principle on which international law is based, that is, equal sovereignty of States implying non-intervention of one State in the internal affairs of another, has been systematically violated, to the point of being practically forgotten, by champions of the “right of humanitarian intervention”. 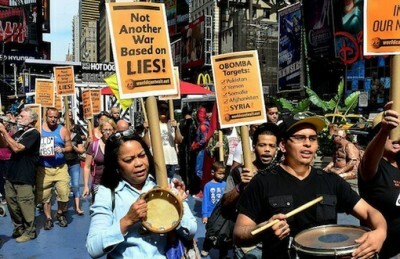 Recently, a number of such advocates of humanitarian intervention, self-identified as stalwart leftists, have joined the chorus of the Washington war party in reproaching the Obama administration for failure to intervene more in the military efforts to overthrow the government of Syria. In short, they are blaming the Obama administration for not having sufficiently violated international law. Indeed, just about everything that the United States is doing everywhere in the world violates the principle of non-intervention: not only “preventive” invasions, but also influencing or buying elections, arming rebels, or unilateral sanctions and embargoes aimed at changing the target country’s policies. Those who consider themselves on the left should take note of the historic basis of those principles. First, the lesson drawn from the Second World War. The origin of that war was Germany’s use of minorities in Czechoslovakia and Poland, extended later during the invasion of the Soviet Union. The war finally had catastrophic consequences for the very minorities that were used by the Germans. Partly for that reason, the victors who wrote the United Nations Charter outlawed the policy of intervention, in order to spare humanity the “scourge of war”. The Heads of State or Government reaffirmed the Movement’s commitment to enhance international co-operation to resolve international problems of a humanitarian character in full compliance with the Charter of the United Nations, and, in this regard, they reiterated the rejection by the Non-Aligned Movement of the so-called “right” of humanitarian intervention, which has no basis either in the Charter of the United Nations or in international law. It is obvious that such “interventions” are only possible on the part of strong States against weak States. It can only be a case of might makes right. However, even all strong states are not equal among each other. Let’s imagine for a moment that the right of intervention is accepted as a new principle of international law. What would happen if Russia tried to overthrow the government of Saudi Arabia because of “human rights violations” in that country? Or if China were sending troops into Israel in order to “protect the Palestinians”? One would quickly arrive at a new World War. To understand the “unacceptable” character of interventionist policies, it is enough to think of the American Establishment’s shrieks of alarms following the alleged Russian hacking of certain emails made public by Wikileaks. Note that the reality off this hacking remains to be proven (see here) and that, even if it were true, it would only mean that the hacking enabled the American public to become aware of some maneuvers by its leaders, which is a peccadillo compared to American interventions in Latin America, the Middle East or Indochina. The consequences of US interventionist policies are multiple and catastrophic. On the one hand, you have the millions of deaths due to American wars (the following study arrives at a total of 1.3 million victims, counting only the”war on terror“). Moreover it would be a mistake to imagine that the victims of interventions will not react to the threat of intervention by building alliances and trying to defend themselves by increasing internal repression. When the United States was attacked on September 11, 2001, Washington introduced unprecedented security and surveillance measures and, far worse, invaded two countries. How can one imagine that Syria, Iran, Cuba, Russia or China will not take repressive measures to protect themselves from foreign subversion? Thereby one enters into a logic of unending wars. Indeed, after having themselves intervened in Ukraine and Syria, the Western powers then entered into conflict with Russia and China because of the measures that those countries took in response to those interventions. Far from being a source of peace, the Security Council of the United Nations becomes the scene to express endless acrimonies. In the case of Syria, if, at it now seems, the insurrection ends up being defeated, the Western policy of intervention by arming the rebellion will be shown only to have prolonged the suffering of the population of this unfortunate land. The “human rights defenders” who defended this interventionist policy bear a heavy responsibility in that tragedy. Although defense of human rights is a liberal concept and liberalism is in principle opposed to fanaticism, today’s “human rights defenders” often display fanaticism. We are warned against a perfectly imaginary Russian influence in Europe (compare the U.S. commercial, cultural, intellectual, diplomatic influence in Europe to that of Russia) and we are told not to consult the “Kremlin medias”. But in any war, and support to the Syrian insurrection is a war, the first casualty is truth. Any truly liberal mind would consult the « propaganda » of the other side, not to take it on faith, but in order to counterbalance and evaluate the propaganda to which his own side is constantly subjected. Leaving aside “Russian propaganda”, such “human rights defenders” seem unable to pay attention to the following study: “Possible Implications of Faulty US Technical Intelligence in the Damascus Nerve Agent Attack of August 21, 2013.” This study, done by a former UN arms inspector Richard Lloyd and a Professor of Science, Technology and National Security at MIT, Theodore A. Postol, concludes that the gas attack near Damascus in August 2013 that almost resulted in all-out war against Syria, could not be due to the Syrian government. It is difficult to imagine that experts in such positions would deliberately lie in order to “support Assad” or that they are incompetent concerning relatively elementary questions of physics. The “human rights defenders” also question whether it is still possible to talk with Putin “after Aleppo”. But the U.S. “war on terror”, including the invasion of Iraq, with its hundreds of thousands of deaths, has never prevented anyone from talking to the Americans. Actually, after that 2003 war that France disapproved, France became more integrated into NATO and followed the U.S. more faithfully than ever. Besides, the European “human rights defenders” are in a particularly absurd situation. Consider, for instance, the alleged use of chemical weapons in 2013 by the Syrian government. There was wide agreement in France over the need to intervene militarily in Syria. But, without American intervention, such a purely French one turned out to be impossible. The European “human rights defenders” are reduced to beg the Americans: “Make war, not love!” But the Americans suffer from “war fatigue” and have just elected a president opposed in principle to wars of regime change. The only possibility for the European “human rights defenders” is to have their own peoples accept massive military spending in order to create a relationship of force that would make the interventionist policies possible. Good luck! Finally, one must distinguish, among the “human rights defenders” the Noble Souls and the Beautiful Souls. The Noble Souls warn their “friends” against the idea of “supporting “ the butcher, the criminal, the murderer of his own people, Bashar al Assad. But this misses entirely the point of the anti-interventionist attitude. States can support other States by giving them weapons and money. But individuals, or social movements, like an antiwar movement, cannot do that. So, it makes no sense to say, when individuals express criticism of interventionist policies in our society, necessarily in a marginal way, that they “support” this or that regime or leader, unless one considers that all those who do not want Russia to intervene in Saudi Arabia or China in Palestine support the Saudi regime or Israeli colonization. Anti-imperialists support another foreign policy, for their own governments, which is an entirely different matter. In every war, there is massive propaganda in favor of those wars. Since present wars are justified in the name of human rights, it is obvious that the war propaganda will concentrate on “violations of human rights” in the countries targeted by interventionists. Therefore, all those who are opposed to the interventionist policies have to provide full information to counter that propaganda, for example, the study mentioned above concerning the use of poison gas in 2013, or the testimonies about Aleppo that contradict the dominant discourse (for example a former UK Ambassador to Syria). It is quite remarkable that some leftists, who are very critical of their mainstream media when it comes to domestic policies, swallow almost entirely the Western “narrative” when it comes to Russia or Syria. But if the media distort reality in our own countries, why wouldn’t they do the same when it comes to foreign countries, where things are harder to verify? This critique of war propaganda has nothing to do with “support” for a given regime, in the sense that such a regime would be desirable in a world freed of interventionist policies. The Noble Souls want to “save Aleppo”, “are ashamed of the inaction of the international community” and want to “do something”. Yes, but do what? The only practical suggestion that was made (before the recent events) was to create a “no fly zone” that would prevent the Russian air force from helping the Syrian army. But that would be one more violation of international law, since Russia was invited to Syria by the legal and internationally recognized government of that country, in order to combat terrorism. The situation of Russia in Syria is not, from a legal point of view, very different from the one of France when it was invited by the government of Mali to come fight the Islamists in that country (who, by the way, were in Mali because of the French-backed intervention in Libya). Moreover, intervening militarily in Syria would imply either a war with Russia or a Russian surrender without fighting. Who wants to bet on the latter possibility? To illustrate the hypocrisy of the Noble Souls, compare the situation in Syria and in Yemen. In Yemen, Saudi Arabia is committing numerous massacres, in total violation of international law. If you are indignant because nothing is done about Syria, why don’t you do something yourselves about Yemen? Moreover, there is a big difference between the two situations. In the case of Syria, a military intervention might lead to war with Russia. In the case of Yemen, on the other hand, it would probably be enough, in order to put pressure on Saudi Arabia, to stop delivering weapons to that country. Of course, the Noble Souls know perfectly well that they are unable to stop such deliveries. But, then, what is the point of being indignant about Syria? The Beautiful Souls, on the other hand, are against all wars, all violence. They “condemn” Assad and Putin of course, but also Obama, the European Union, NATO, everybody! They denounce, they light candles and turn out lights. They “testify”, because “remaining silent” means “being complicit”. But what they do not realize is that, on the ground, in Syria, nobody, whether the government or the rebels, know that they exist and, if they knew, they couldn’t care less about their indignations, condemnations and lighting up of candles. This does not mean that the Noble Souls and the Beautiful Souls do not have any effect. They have one, but here it is: to stand in the way of any alternative foreign policy in their own country, which would be based on diplomacy and respect for the United Nations Charter. Yet, only such a policy would favor peace in the world, balance and equality between Nations and, eventually, advance the cause of human rights. But the demonization by the “human rights defenders” of Assad and Putin, as well as of anybody willing to talk to them, renders such an alternative politically almost impossible. For the “human rights defenders” political realism and the consequences of their actions have no importance: what matter to them is to show that they belong to the “camp of Virtue”. You imagine yourselves as being free, while following at each step the indications of the dominant media as to what should be the object of your indignation. If I had the slightest illusion concerning the lucidity that you may have about the consequences of your actions, I would call them criminal, because of the harm that you do to Europe and to the rest of the world. But since I harbor no such illusion, I will limit myself to call you hypocrites. Final document of the Thirteenth Conference of Heads of State and of Governments of the Movement of Non-aligned Countries, Kuala Lumpur, February 24-25, 2003, Article 354. (Available on http://www.bernama.com/events/newnam2003/indexspeech.shtml?declare).